The Farro Spring Salad features my favorite spring vegetable, asparagus! The Broccoli recipe was developed for North Carolina’s Farm to School program as part of Chef Cyndie’s K12 Culinary Team. I like introducing schools to a different way of preparing broccoli; roasting rather than steaming! Rinse and drain farro. Place in a pot and add enough water or stock/broth to cover. Add a pinch of salt. Bring to a boil; reduce heat to medium-low and simmer 30 minutes. Drain off any excess liquid. Transfer to a cookie sheet (the thinner the farro is spread, the faster it will cool!) and slightly cool. Snap off ends of asparagus and cut into 1 inch pieces. Cut cherry tomatoes and sugar snap peas in half. Bring a pot of water to a boil. Add asparagus and sugar snap peas. Cook for 2 minutes. Immediately drain and submerge in an ice bath or place in refrigerator. Once cool, drain (if using ice bath). 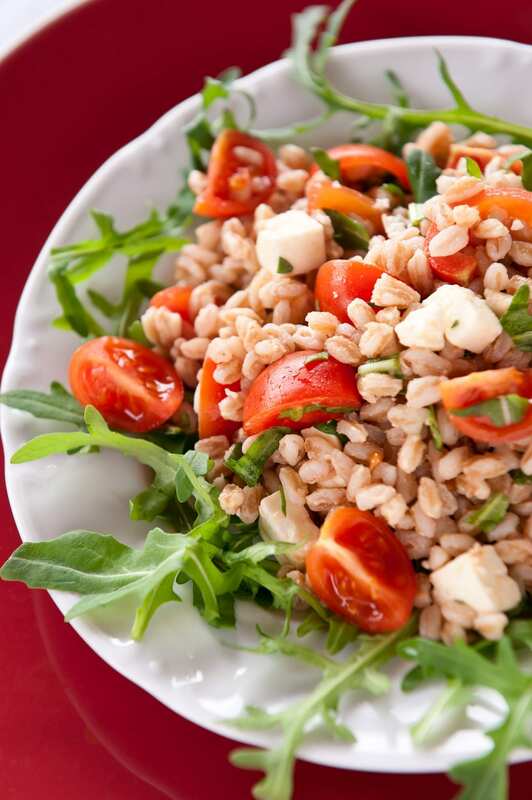 Add slightly cooled farro, vegetables, feta cheese, and chopped herbs to dressing. Using, a spatula, fold to evenly coat. Season with salt and pepper to taste.